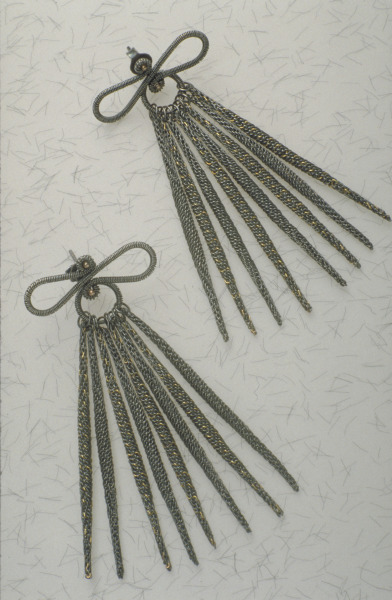 Pair of bow-shaped silver earrings with seven dangling woven parts and detachable studs. Oxidised sterling silver and 9ct red gold. Detachable stud earrings are bound using fine silver innerframe. Main earrings made from eight braided hollow tubes, deformed and stretched by hammering. These earrings were the first to employ experiments with braiding technique ie. tubes were hammered into tapers at either end - stretching and deforming the wires. More developments with this technique have since been employed.